Q: What do these celebrities all have in common? A: They’re so iconic, they only need one name. So when I first encountered the Vunderbar, I thought Wow, that’s ballsy. This dessert thinks it has one-name status already. I mean even the classic Chocolate Chip Cookie hasn’t aspired to one-name status yet. – an idealized virtuous and beautiful woman. Anyhoo, the Vunderbar is indeed Wunderbar. It’s so Wunderbar, in fact, that I ate it for breakfast. So Wunderbar that my dog Lucy licked the parchment paper it came out of. So Wunderbar that my husband put a secret Ziploc baggie of all the scrap pieces I cut off the edges in the freezer and has been sneaking them when he thinks I’m not looking. When your non-sweets-eating husband freezes the scraps of a recipe, you know this one is a keeper. It’s iconic. It’s worthy of one-name status. And did I mention there’s no actual baking involved? p.s. This recipe calls for a 9-inch pan, and these bars will go all the way to the top of the pan. They are tall. If you prefer, you can make these in a 9×13. You’ll just need to double the topping to cover the extra surface area. Line a 9-inch square pan with parchment paper, leaving about 2 inches on each side to use as "handles" when removing the bars later.. 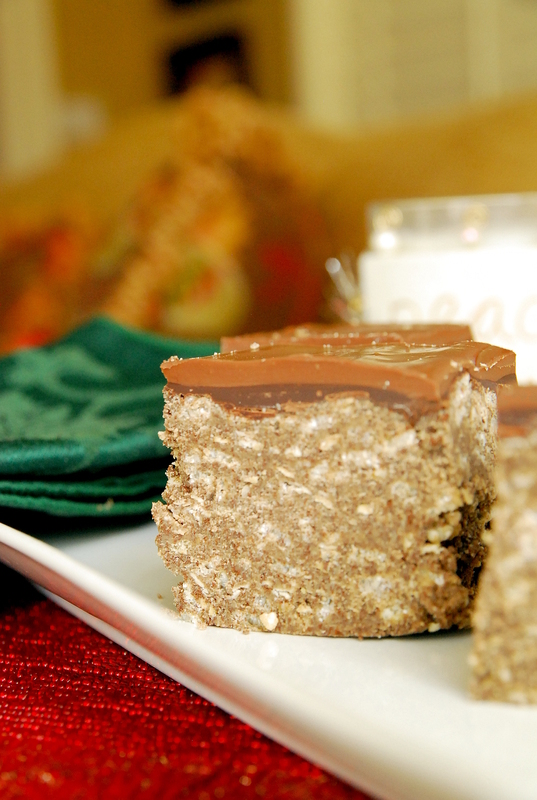 In a large bowl, combine chocolate wafer crumbs, confectioners' sugar, Rice Krispies, oats, and salt. Set aside. Place peanut butter and butter in a microwave safe bowl. Cook on High until melted (about 2 min) stirring every 30 seconds. Pour the peanut butter/butter mixture over the chocolate wafer mixture. Stir until well combined. Transfer mixture to prepared pan. Spread evenly. Place the dark chocolate in the same microwave-safe bowl (no worries if there's still a little PB mixture in there). Heat in microwave at half-power in 30-second increments until chocolate melts when stirred. 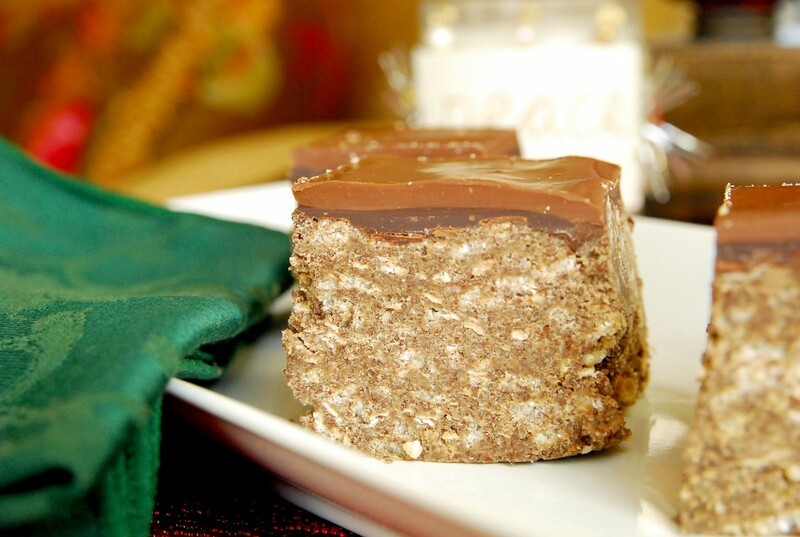 Pour melted chocolate over bars. Spread evenly. Place bars in refrigerator until chocolate has set. To make the topping, place milk chocolate chips and peanut butter in a microwave-safe bowl. Heat in microwave at 60% power, stirring every 30 seconds, until mixture is smooth. Remove the bars from the refrigerator. Spread over chilled bars. Refrigerate for 2 hours or overnight. Run a knife along the two sides of the pan that aren't lined. Use the overhanging parchment paper to lift the bars out of the pan and onto a cutting board. Use a long, sharp knife to cut into 2"x1" bars.